More and more I find myself in the tension between wanting to control this little girl, getting her to comply, while also being astonished by how much confidence and will power she exerts. Most days we don’t battle clothes. She can wear what she wants as long as it fits with the weather. 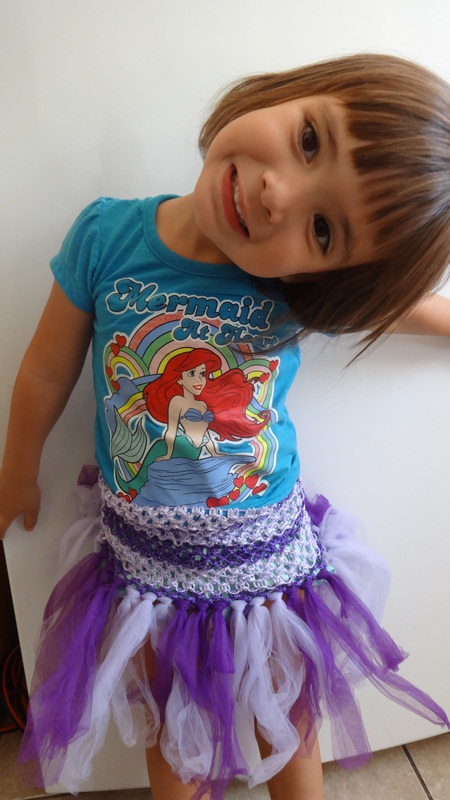 So when she came out with this on my only request was she add shorts underneath for maximum play and movement. 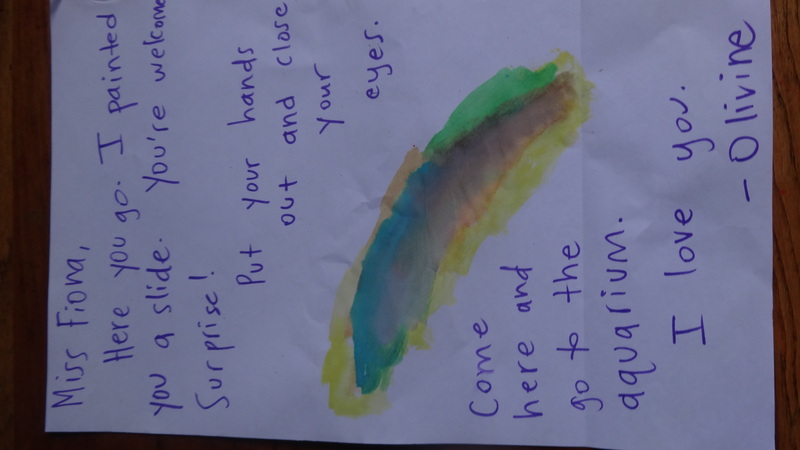 She is also making daily discoveries at preschool. I moved the clip down low as we rotate out the piles of work she brings home. Luckily I have not been asked where they go when they leave the clip (mostly to the recycle bin) because she is enamored with what is being put up next. 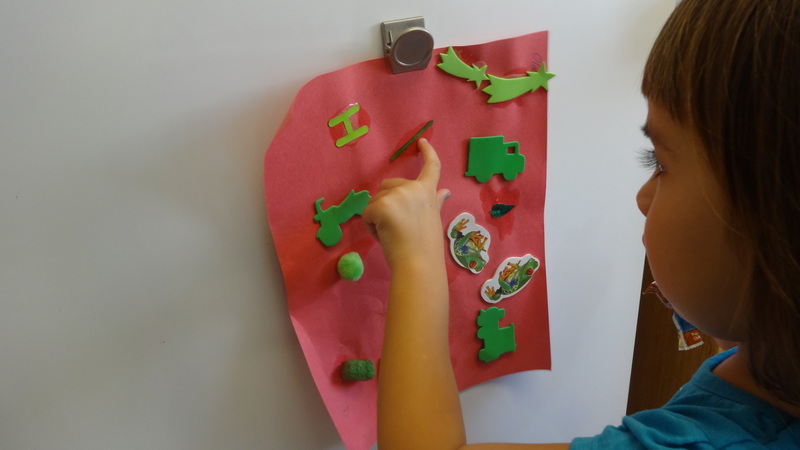 There is lots of talk of colors, shapes, animals, and textures. I listen carefully as she shows me the “H” like in Henry’s name and the soft cotton ball with sparkles. I try hard to run with ideas she comes up with if we have the time. I catch myself saying “hurry up” or “let’s go” so now I am trying to say more of “Where do you want to go?” and “What do you want to do?” This gives her a space to make the decisions and be in charge, just like she craves. There was a morning recently where she wanted to write her cousin Fiona a letter on top of painting she had done. When she was finished we addressed the envelope together (I wrote while she added the “sticker”) and held hands over to the mailbox around the corner. 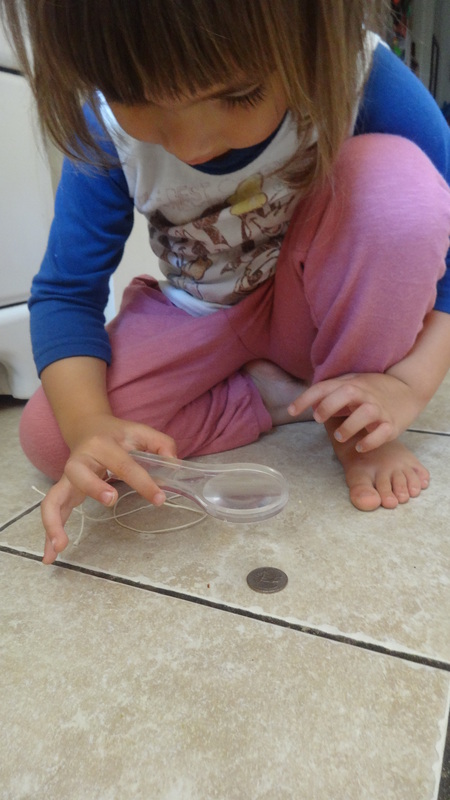 Her other concern is the game her brother’s play called “heads or tails.” She loved this the until the other day when I came into the kitchen and she was sitting on the floor with the magnifying glass and a quarter. She was so perplexed and kept asking about the tail on the bird. She noticed feathers and a branch, but no tails. I recognize she is naturally a critical thinker who asks good questions, and I know this doesn’t come from trying to over control her.